BOULDER, Colorado - The trouble-plagued, delayed, andcost-overrun Mars Science Laboratory mission is crawling out of the technicaland financial dog house. 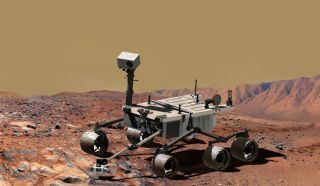 Still,there's one issue that could keep the roughly $2.3 billion NASA missiongrounded: titaniumparts that may not be strong enough for the robotic rover. That's theword from NASA officials during a NASA Advisory Council's Planetary ScienceSubcommittee meeting held here earlier this month. The goodnews comes from a November "Readiness to Proceed" review of the NASAMars Science Laboratory (MSL) that took a hard look at problem-plaguedactuators, the robot's avionics and power systems, as well as other aspects ofthe mega-rover. The bottomline, according to Doug McCuistion, Director of the NASA Mars ExplorationProgram: Technical and budget activities are stabilizing and variables allappear to be converging. The MSLrover has instruments designed to test the Martian surface for signs of pastpotential habitability. It has been beset by cost overruns anddelays. Right now,McCuistion reported, no insurmountable technical obstacles seem to be in theway of getting MSL Mars-bound in 2011. The nuclear-powered robot ? now named "Curiosity"? is being built at the Jet Propulsion Laboratory (JPL) in Pasadena, California. "MSLis really stabilizing both technically and budgetarily," McCuistionreported Dec. 3 to the subcommittee. That beingsaid, there is an MSL issue that needs resolution. "Oneshow-stopper?is still titanium," explained Jim Green, Director of NASA'sPlanetary Science Division. Theissue: It turns outthat some 700 titanium parts used within the MSL have been identified so far.Still to be evaluated at the time of the meeting is use of the material in MSLinstruments. Theproblem: A firmthat supplied titanium falsified documentation on the treatment of thatmaterial, saying it met military specifications. This translates to NASA concernsthat the material may not be strong enough to hold up for Mars duty. Now thetask for NASA is finding out whether the titanium used in MSL is the "rightstuff or the wrong stuff," McCuistion said. If it's on the edge, he said,then an assessment of risk to the MSL project will need to be weighed. Diving intoall the paperwork to understand the pedigree of the titanium is a labor-intensiveactivity. The necessary data should be compiled early next year. In apost-meeting communication with McCuistion, the MSL titanium parts identifiedto date has now risen to over 900, but nearly half of them have been cleared. The biggestthreat is use of suspect titanium in the large rover's rocker-bogie suspensionsystem. That's the classy chassis of the machine, the base to which everythingattaches. That baseneeds to strong given the rover's touch-down via MSL's Sky Cranelanding system. If found tobe a problem in that section of MSL, reproducing elements of that hardware toreplace bad titanium "could stop us," McCuistion reported. "We'reworking this through...right now, we haven't run across anything that's ashow-stopper," he added. "Atthis point, I know JPL engineers are working hard to complete construction andI have all fingers and toes crossed that MSL launches on time and landssuccessfully," said Fran Bagenal, Acting Chair of the NASA AdvisoryCouncil's Planetary Science Subcommittee. She's also a professor ofastrophysical and planetary sciences here at the University of Colorado, Boulder. How's MSL'sescalating cost impacting non-MSL space activity? "Obviously,a major lesson from MSL for all planetary missions is to work hard to improvethe fidelity of budget estimates," Bagenal told SPACE.com. "We haveput potential Outer Planet Flagship (OPF) missions through two cycles ofscience, technical, management and cost reviews. So, I believe the currentestimates of the cost of the Jupiter Europa Orbiter mission," she said, "areat much better fidelity than MSL at the same stage." Bagenalsaid she is concerned that the proposed future Marsmissions in 2016 and 2018 have not been through such a review process. "Thereis no non-Mars item that I could point to and say 'that was cut due to MSL,'"Bagenal said. "Certainly, elements of the Mars program have been hit hard." Perhaps oneway to look at the issue is to think about all the planetary science one mighthave done with MSL's $400 million-plus overrun to date, Bagenal observed. "That'sa whole Discovery or Mars-Scout mission, or twice the annual total Research& Analysis budget," she concluded.